This is Cheerio! He went home today. I wasn't expecting him to be gone when I got there tomorrow, but I'm happy for him. This video is from last year when I bought him a new cage. And just like that, Cheerio is back. I'm not sure exactly why, but if he had to come back, it's better now than later. He still sees the rescue as home and will readjust much more quickly. He's a good bird and we will find the right home for him. So glad he came back instead of being passed on. liz wrote: So glad he came back instead of being passed on. We have protections against that in the adoption contract. liz wrote: Did they give a reason? I don't really know. I don't even know if the adopters gave up on him or if the rescue requested that they return him. Either way, he's back now, and was having fun in the aviary yesterday, playing with a whole herd of kids. Someone IDd one of the lorries as a Melanistoc Stella's Lorikeet. Stunning black bird. I hope the link works. Pictures of Cheerio. Our Director posted this on our Facebook page. 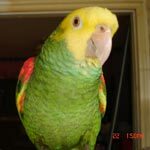 "We are very thorough in our requirements and education of prospective adoptees in order to adopt a bird from our rescue. We have had very few birds over the years that come back to us, but on occasion it does happen. One thing we stress over and over again to people is the need to let the bird "settle in" to their new surroundings for at least 30 days and give them space. 99% of our adoptees have no problem and do this with no issues...but on occasion we will have a family that will agree to our policies and then get home and do the opposite. This was the case with Cheerio so we brought her back." Yes, people promise to follow the instructions you give them and then don't - everybody who adopts out has the same problem. Cheerio was lucky that she (it's a she?) came back so soon because, in the greatest majority of the cases, they go under the radar and the poor bird ends up living in a home where it's not understood or treated right for years -and that's how they end up having behavioral problems that, sometimes, can't be fixed. It's never 'them', it's ALWAYS 'us' that mess up but they are the ones that pay the price for it.